It’s that time of the year – when we announce the hottest food challenge in Las Vegas. If you’ve seen an episode of Man Vs. Food on the Food Network, you understand food challenges come in all shapes and sizes. You also know how a spicy food challenge can hurt your insides. At that time, the hottest spice in our curry was the Ghost Pepper a.k.a. “Bhoot Jholakia” with a Schoville Heat Unit (SHU) of 1,041,427. In 2016, we bumped up the spice level by 1 Million SHU when we included the Carolina Reaper and the Trinidad Moruga Scorpio chili. (Yes, our chef got brutal!) Just for the record, the Carolina Reaper is the hottest chili in the world with a 2.2 million SHU. Many of our diners have taken the plunge, much to the chagrin of their digestive tracts. Some have made it past the bathroom to our Wall of Flame, and others just decided to give up. 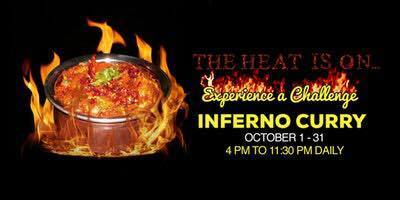 It’s that time of the year again, and we are inviting extreme-heat seekers to complete our Fifth Annual Inferno Curry Challenge. The rewards are sweet! At our West location, we also have a graph that describes the heat content of a list of chilies from around the world – and it shows you which ones we use in our Inferno Curry Challenge. Each year, from October 1-31, anyone who dares to attempt and finish Mint Indian Bistro’s signature Inferno Curry receives a most coveted spot on Mint Indian Bistro’s Wall of Flame. Also, they also receive a $50 Mint Indian Bistro gift card as well as an entry into a drawing for complimentary dinner entrees for a year (one per month, 12 entrées total). The challenge is available at both locations during dinner hours only! Ready to test your spice tolerance? To order the Inferno Curry dish, you must sign a waiver. We serve the inferno Curry from 4 p.m. to 11:30 p.m. daily. We make the curry made with fresh veggies ($17.99), chicken thigh ($18.99), or boneless lamb ($19.99). We cater to special diet groups like vegetarians and vegans. We also serve Halal meat and gluten-free delicacies, and this extends to our Inferno Curry Challenge as well. We use natural chilies, not extracts, so we always warn our guests to try it at their own risk. Please know that we don’t just serve spicy cuisine. The Inferno dishes are only a part of the menu, and the Inferno Curry we use for the challenge is separate from even the Inferno Menu. The whole concept of the menu is based on the fact that no matter what dietary philosophy you follow, Mint Indian Bistro has something for everyone. So as it gets cooler outside, who’s up for some serious heat? food that appeals to all five senses.